We came past Gino Sorbillo’s restaurant by sheer coincident whilst walking to the ‪Katz’s Delicatessen one evening (oh yes, I am well aware this makes us sound as if we’ve been eating non-stop during this New York trip… and you know what? That’s probably right. I haven’t had this much food in months). 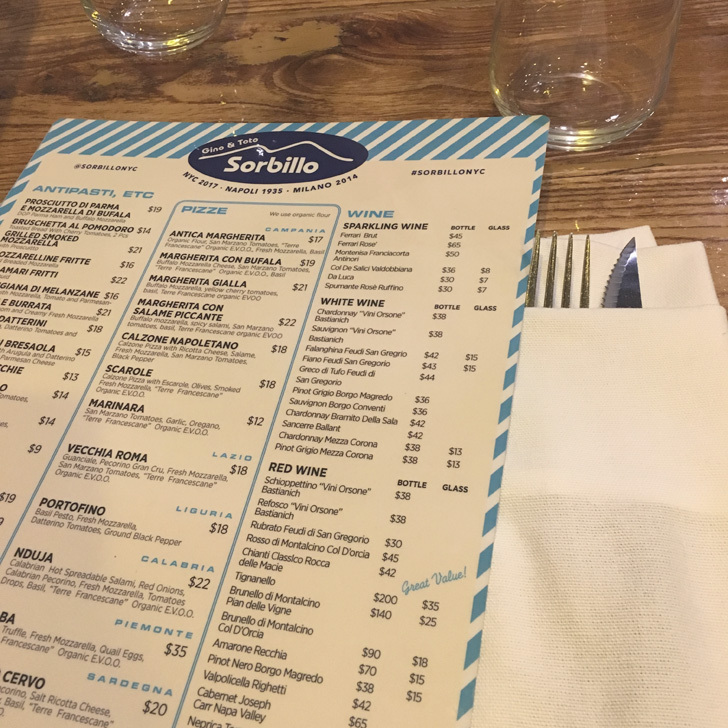 Our Italian friend got all excited, realizing that Sorbillo’s restaurant had finally opened (it actually opened a couple of weeks ago at the end of November). Being from Naples himself, he told us that Gino Sorbillo was an institution back home and your must-go destination for an authentic ‪Naples pizza. Having been to Italy twice last year (in Rome and Bologna), we sure appreciate a true ‪Italian pizza and favour it over the classic American pizza anytime. So we decided to go and give Sorbillo’s a try. On a whim we thought to actually go online and see if we could book a table. Good thing we did. We manage to bank ourselves one of the last tables for 8.30 and even with a booking we had to wait a little upon arrival (not long though and to be fair, we were a little early, so our table was probably ready on time, I didn’t actually check my watch when we sat down). Despite it being ‪Wednesday evening the place was packed. A very mixed clientele, some clearly popping in after work, all suited and booted, others (like us) in jeans and shirt. We were shown to our table, right in the back. Which was actually quite a good spot. 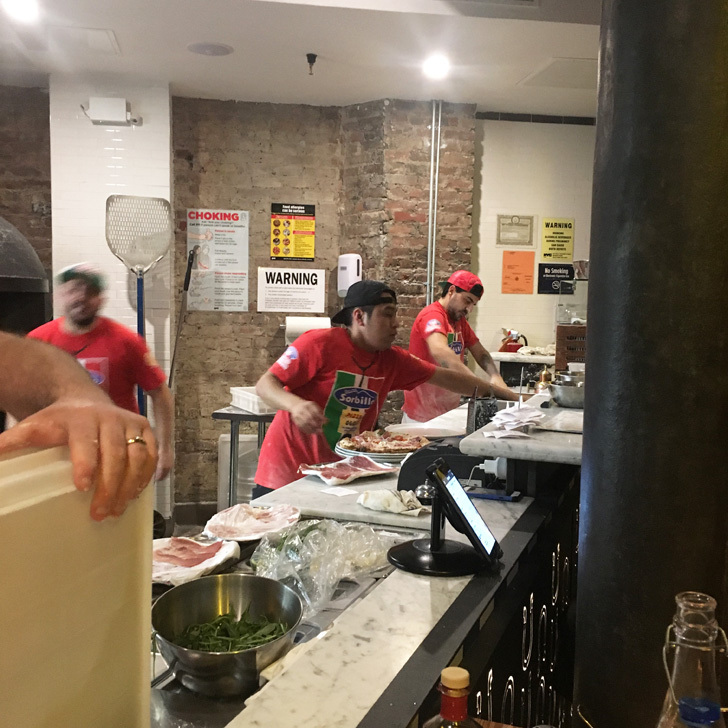 For one you were out of the way with no one trying to squeeze past you and it also meant we could see all food heading out of the kitchen… and watch the pizza boys in action (they have a large pizza oven in the back of the restaurant). On the down side, we felt a little forgotten back there… well actually not forgotten, after all we had three guys asking us if we wanted some water to start with… they just forgot to actually bring us some… or take our order. But eventually we managed. As we both tried to keep this a fairly light dinner, we opted just for pizza, no starter or sides with it. Although I must say I was very tempted by their meatballs. They did look yum as they ‘walked’ past us on their way out of the kitchen. 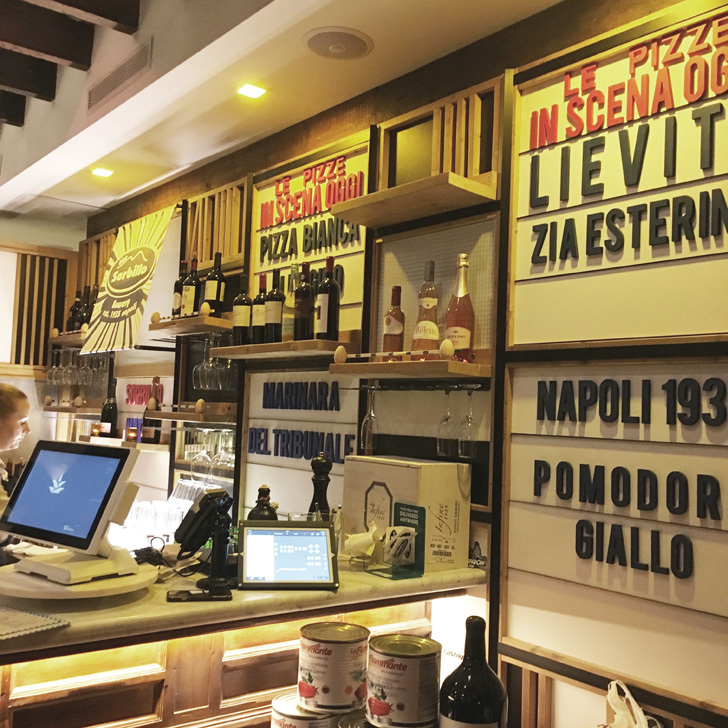 They had a nice selection of pizzas on the menu, from different regions of Italy, not just from Naples. I went for the ‘Antica Margherita’ with mozzarella and tomatoes, Mr T (oh yes, hubby does actually have a name and does not only go by his marital status) went for the ‘Bologna’ with Parma ham, parmesan cheese and cherry tomatoes. Accompanied by some dry red wine for me and a Peroni for him. I must say both pizzas were quite nice. A little downside was that they didn’t arrive the same time, but since we were going to share them both anyway, we just ate one first and then the other when it eventually arrived. Was it the best pizza I ever had? Honestly… no. Is it the best pizza in town? I don’t know. But it certainly was a world apart from the pizza we had in Little Italy during our first trip to New York (where we ended up in a horrible touristy Italian restaurant with poor food and rude staff). 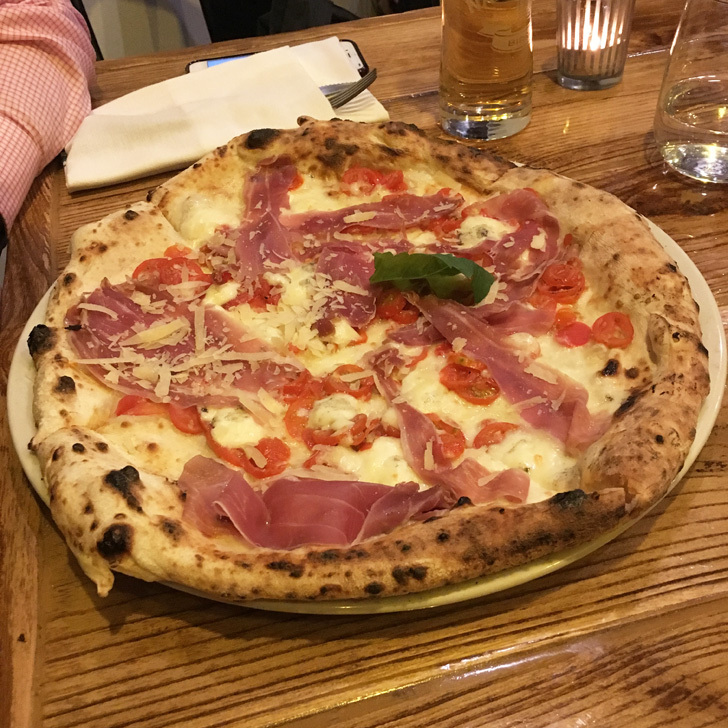 It is a decent Italian pizza and I would certainly recommend it…. And I would probably go there again if we were in the area. Whether I’d specifically head there again just for the pizza? Not sure. Just to be clear. This is not a sponsored post, just me sharing my experience. We paid for all of our food and drink ourselves.